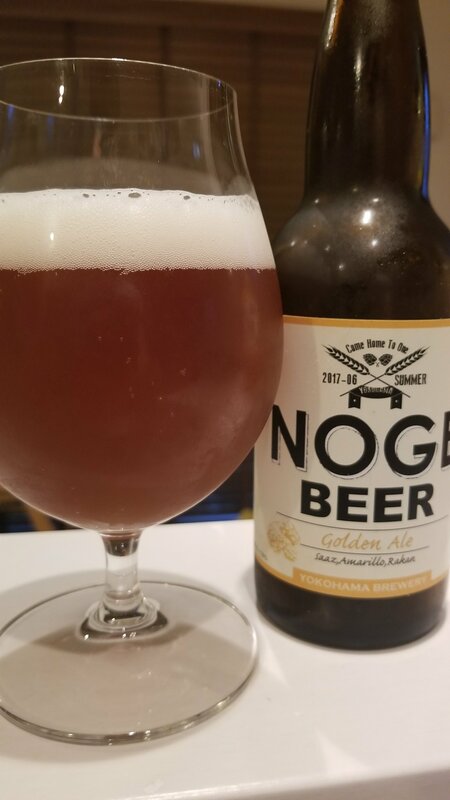 Yokohama Noge Beer is a 5% golden ale from Yokohama Beer, based in Kanagawa, Japan. It’s part of their limited edition range and is a celebration of the Noge area, located a stone’s throw from the brewery in Yokohama. Besides that, there isn’t much information about Yokohama Noge Beer there. Yokohama Noge Beer, besides not having any information about it, is a peculiar beer. The brewery is located near Noge, but perhaps the Bashamichi area where the brewery located would have been better but then I guess that is too long a name to put on a bottle. It poured out an amber brown colour with a fair amount of fluffy white head on top, which lingered for quite a while. There was a slight tartness coming off of Yokohama Noge Beer, with some floral hints, but not much mind. The malts brought a subtle biscuit snap to the beer but like the hops, were all too delicate. The body of Yokohama Noge Beer was as gentle and subtle as the nose, with floral and biscuit flavours coming through but faded fast. There was a faint tartness to the aftertaste that lasted longer than the other flavours but it was over all too soon and quickly forgotten. Noge is a bold and vibrant area of Yokohama with lots going on – unlike Yokohama Noge Beer. A disappointment from start to finish. Yokohama Noge Beer can only be bought in participating places in the Yokohama area.